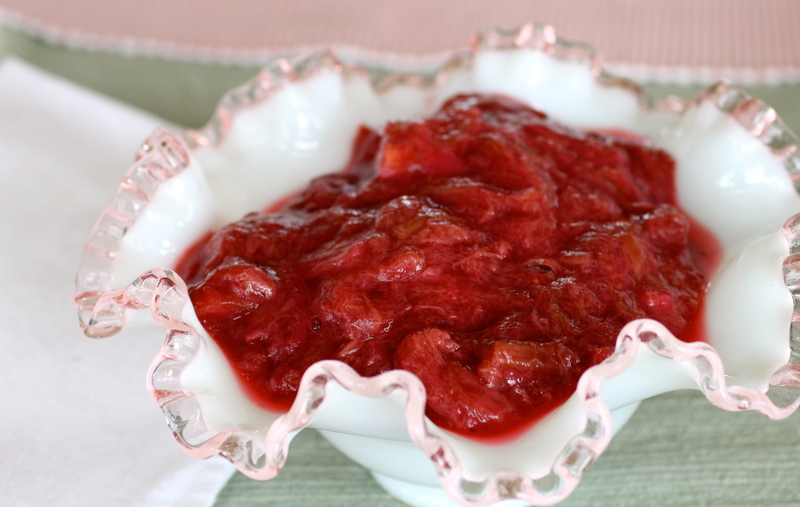 Rhubarb Compote is one of the first recipes I make in spring. This rhubarb, ginger, and orange recipe tops yogurt, oatmeal, cornbread, and ice cream! One of the things I like best about rhubarb is that it’s one of the first plants to wake up in spring. Once it starts growing, it really gets going. It seems each time I pass by more leaves have unfurled and stretched out. The thick celery-like stalks of this buckwheat family member can reach up to 2 feet long. The stalks are the edible portion of the plant. Not the leaves. They can be toxic. 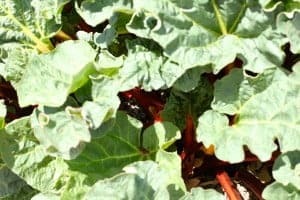 When harvesting, don’t cut the rhubarb stalks from the plant, but instead grab a stalk right down where it emerges from the ground, use a sort of rocking, twisting motion to pull it away from the plant. The stalks slip right out. I trim the leaves and ends while I’m still outside. In the house, I fill the sink with cool water and let the stalks float for several minutes to rinse away dirt. Rhubarb can be green to red so color isn’t a good indicator of ripeness. Look for firm, rhubarb stalks with a bright, glossy appearance. Stems should have some pink or red color, although many good-quality stems will be predominately light green. Extremely thick stalks may be tough. Peeling the stalks is generally not necessary. Rhubarb freezes well. Just rinse, trim into cubes and pack in airtight containers. But if you’re like me and eager to get cooking with the first edible thing around, you’ll wait until later to freeze some. Here are some ideas to get you going. Rhubarb is versatile to cook with because it can be used in sweet as well as savory dishes. Strawberry and rhubarb are a classic combination but so is rhubarb and ginger. I often add chopped crystallized ginger or chopped fresh ginger into rhubarb recipes. Orange also complements rhubarb. Try some zest or juice as you stir things together. 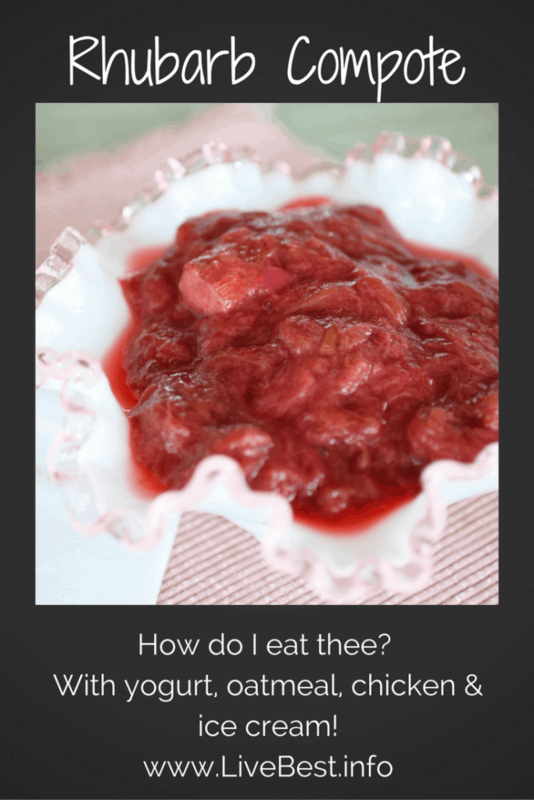 In this compote I used all three: rhubarb, ginger, and orange. I use this to top yogurt, oatmeal, cornbread, and ice cream. If there is any left, it freezes well in an airtight container. Rhubarb reacts with some metals (iron, copper and aluminum) so should be cooked in stainless steel or enameled cast iron. 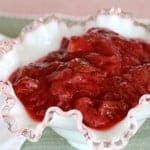 Rhubarb Compote is one of the first recipes I make in spring. Rhubarb, ginger, and orange simmered together, I top yogurt, oatmeal, cornbread, and ice cream! Combine all ingredients in a heavy-bottomed saucepan. I add the squeezed orange shell in the pot, too. Bring to a boil over medium heat, stirring occasionally. Cover and simmer gently for about ten minutes. Rhubarb will begin to soften. Uncover and continue to cook another five minutes. Remove from heat, cool. Remove orange shell. Store, covered, in the refrigerator for up to 2 weeks. May be frozen.